Books are an integral part of any homeschool. Whether your daughter finds literary selections during a weekly trip to the library or whether she grabs a book from your family’s personal selection, you’ll want your daughter to stimulate her mind with great reading selections. I enjoy doing read alouds with my girls because they help to promote a life long love of reading, provide us with opportunities to bond, enhance the girls’ listening skills, and spark a wide range of mother/daughter discussions. If you’re looking for great books to share with your daughter, consider the list below. 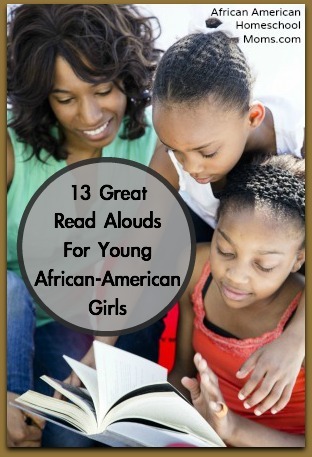 It showcases thirteen great read alouds my three daughters love! Sleeping Cutie by Andrea Davis Pinckney: Cutie LaRue is a wonderfully well behaved little girl until it’s time for her to go to bed. Tired by their daughter’s tantrums, Cutie’s mother and father buy her a toy named Night Owl who introduces Cutie to the Dreamland Nightclub. Bring Me Some Apples and I’ll Make You a Pie: A Story About Edna Lewis by Robbin Gourley: Edna Young is a renowned chef and this delightful book describes a bit of her youth. Readers experience the joy her family shares as they plant, nurture, and harvest their fresh fruits and vegetables. The book highlights the loving relationships among the Lewis family members and features a few of Edna’s delicious recipes. Goin’ Someplace Special by Patricia C. McKissack: Tricia Ann is a young girl living in the Jim Crow era. Anxious to go to Someplace Special, she asks her grandmother Mama Frances for permission to go there by herself. As she makes her way there, Tricia Ann encounters many obstacles, but she presses on and finally makes it to Someplace Special. No Mirrors in My Nana’s House by Ysaye M. Barnwell: A little girl enjoys life in her Nana’s mirrorless house. There the young sees her true beauty, not by looking in a mirror, but by looking in her Nana’s eyes. A Sweet Smell of Roses by Angela Johnson: Two young girls sneak out of their house and head off to a civil rights march. The book details the poignant sights, sounds, and sweet scent of roses around them as they march and listen to a speech by Dr. Martin Luther King Jr.
Scaredy Kate by Jacob Grant:: Little Kate is afraid of dogs and monsters. When she takes a ride on an elevator, she goes on a counting adventure and discovers that monsters aren’t so bad after all. Sweet Clara and the Freedom Quilt by Deborah Hopkinson: Clara is a seamstress in the Big House and she constantly dreams of reuniting with her mother who lives on another plantation. One day Clara overhears two slaves talking about escaping via the Underground Railroad and she realizes she can her scraps of cloth to create a map of the land to aid railroad travelers. Mufaro’s Beautiful Daughters: An African Tale by John Steptoe: Mufaro lives in an African village with his two beautiful daughters. One daughter is bad-tempered, while the other daughter is sweet and kind. When the daughters go before the king, who is choosing a wife, an interesting series of events unfold. 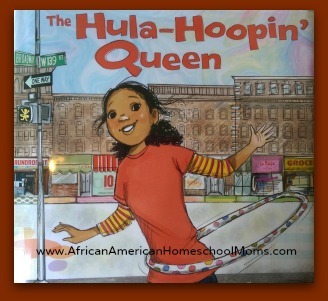 The Hula Hoopin’ Queen by Thelma Lynne Godin: Kameeka loves hula hooping and she’s striving to beat Jamara so she can be the Hula Hoopin’ Queen on her street. But when Kameeka’s hula hooping obsession gets her into trouble with her mom, she learns something surprising about her neighbor Miz Adeline. Dancing in the Wings by Debbie Allen: Sassy is a tall no nonsense girl. Her greatest desire is to become a ballerina. When Sassy gets a chance to audition for a summer dance festival in Washington DC, she must learn to rise above the taunts of others in order to have a chance to fulfill her dream. Uncle Jed’s Barbershop by Margaree King Mitchell: The story is set in the 1920s in the segregated South. Sarah Jean’s Uncle Jed works as traveling barber and his dream is to one day open his own barber shop. After a family crisis and great financial difficulty, Uncle Jed finally opens his shop and Sarah Jean is there to witness the event. Graceful Gabby Finds Love in Blue by Crystal Marable: Gabby has a new room and she’s very excited about it, until she discovers that it isn’t pink. It takes a loving intervention from Gabby’s Grand Ma-Ma to help her appreciate her room and the importance of finding the joy in the things around her. Seeds of Change: Planting a Path To Peace by Jen Cullerton:: This book tells the story of Wangari Maathai the first African woman to win the Nobel Peace Prize. She grows up in Kenya and falls in love with the land, plants, and animals all around her. When given an opportunity to go to school, works hard and is able to study in the United States. When she returns to Kenya, Wangari uses her knowledge to save the land and its people.